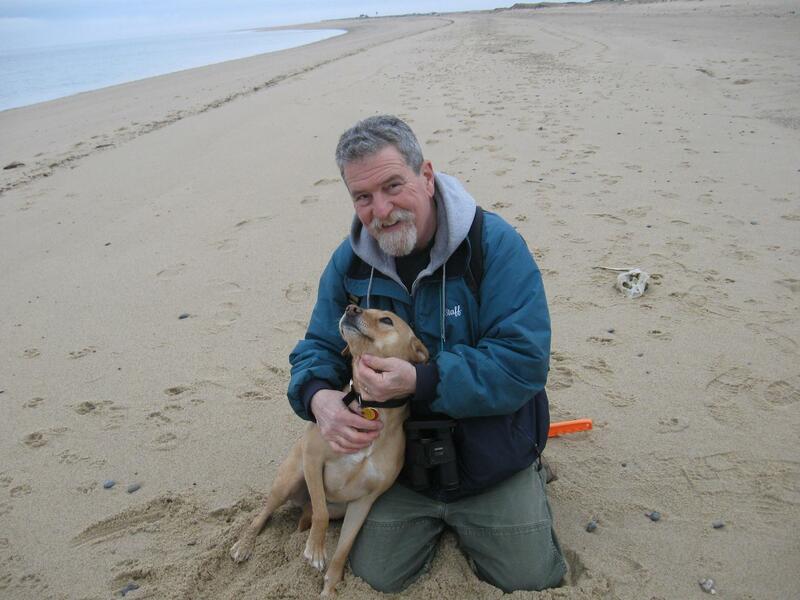 Dennis Minsky with Seanetting dog, Dory. Dennis himself will tell you it’s no big deal, that many Seanetters have done more walks than he. And it’s true. Ray Bosse, for instance, has done over 400 walks so far in his tenure with us. But Dennis recently hit walk number 100, and I told him I’d be writing about him here. Why talk about Dennis Minsky? I’ll tell you. Running SEANET is a true pleasure for me. God knows, I don’t do it for the money. And while I do it for the science as well, the main thing that keeps me here–blogging, checking data, badgering you for photos of your dead birds, traveling on weekends to train new Seanetters–is you guys. The community we’ve built since 2003 has made me believe in citizen science, in regional and local knowledge, and in the commitment you feel to your coasts, and to the world’s oceans. Seanetters come in all stripes. Some of you walk for years, quietly submitting excellent data and never needing anything from me; I salute you for your autonomy. Some of you send me the occasional weird photo, or story, or news clipping of note; I thank you for keeping my job lively and different every day. Some of you keep closely in touch, and though I work from my house in New Hampshire, and you are scattered all over the eastern seaboard, I have come to consider you friends. 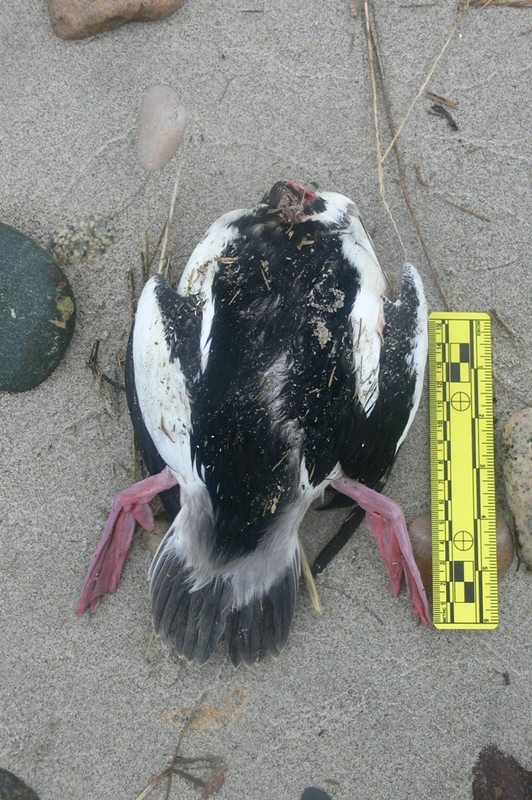 Photo caption, or great band name: Dennis and the Dead Razorbill. Dennis is one of these. In particular, I have come to rely on Dennis for excellent book recommendations, and subsequent email exchanges on our thoughts on these readings. He has known many fine poets and other authors whom I admire, and since I was an English major, this tends to leave me somewhat starstruck. Dennis is living a life I admire, way out there at the end of Cape Cod. A book-filled life, a beach-walk filled life, and a very dead bird-filled life. So don’t let Dennis tell you it’s no big deal. You Seanetters make this project, you make the science, and you make this virtual community we’ve built. I need to do more of this sort of recognition, so indulge me if I email you asking for pictures of yourself in the near future. The fact is that I couldn’t do this without you people. And the truth is, I wouldn’t want to. The LC crew: from left, Lori Benson, Katie Montgomery (mostly obscured), Len Boutin, Jenn Grota behind Jamie Bogart (at scope), Walt Granda and Paula Boutin. This past weekend, I had the distinct pleasure of visiting the Lloyd Center in South Dartmouth, MA. The weather was very fine indeed, and I got to finally meet some long-time, dedicated Seanetters. 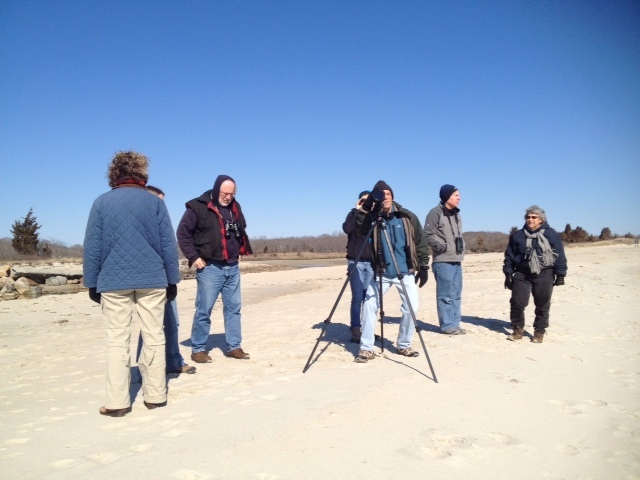 Participants sat through a tour of SEANET data along Buzzard’s Bay, courtesy of yours truly, and then were rewarded with a trip to Round Hill Beach, courtesy of our local coordinator Jamie Bogart. A local high school student, Jenn Grota, may be our newest Seanetter, and Walt Granda, Len and Paula Boutin, and Lori Benson all gave me the rare opportunity to speak with volunteers face to face and not merely via email or the blog. Master’s of Conservation Medicine student Katie Montgomery trekked down to join us as well. Katie has taken on SEANET as part of her Master’s research, and we’ve been so pleased at her interest and commitment to this program. It was a great benefit to me to have her join me in the festivities. 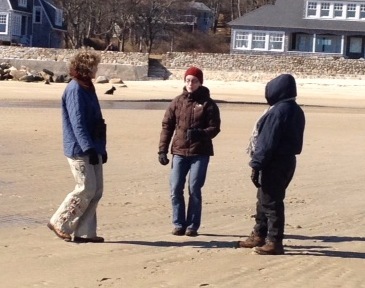 A rare photo of your SEANET blogger, Sarah Courchesne (center) flanked by Seanetters Lori Benson and Paula Boutin. Our stroll along the beach yielded no dead birds (typical for a Buzzard’s Bay beach) but we did spot a few live scoters, bufflehead and cormorants. A glorious day! Thanks to Jamie for hosting, and to the attendees for their interest and particiation. Until next time, Lloyd Center! 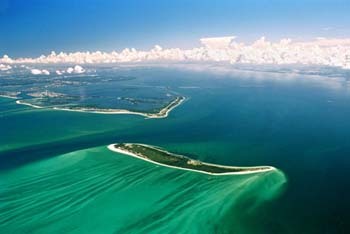 Word came today of the passing of Phil Sorenson, a Seanetter on the Gulf Coast of Florida. Only 61, Phil died on February 10, leaving behind a community of fellow volunteers, naturalists, and outdoorspeople. In addition to SEANET, Phil also gave generously of his time to the Egmont Key Alliance, and to the program Serving Health Insurance Needs of Elders (SHINE), offering guidance through the complex health care system to Florida’s elders. Phil is survived by his mother, Nancy Ann. His friends have planned a memorial service for him on February 25th at 1pm. The service, fittingly, will be held on the beach at Shelter number 6 in Fort DeSoto Park. Friends and colleagues are all invited to bring memories and photos to share. In lieu of flowers, please consider making a donation to one of the many organizations Phil loved and served, or to a charity of your own choice. We send our condolences to Phil’s mom, and to everyone who lived, worked, and volunteered with him. Peace to you all. Join us at the Lloyd Center this Saturday! The view from the Lloyd Center's observation deck. Just a reminder: your SEANET blogger, yours truly, Sarah Courchesne, will venture down to the Lloyd Center in South Dartmouth, MA this Saturday for a meet and greet/training/reconnect. All current and aspiring Seanetters are welcome, as is anyone with any interest in seabirds. So come one, come all! 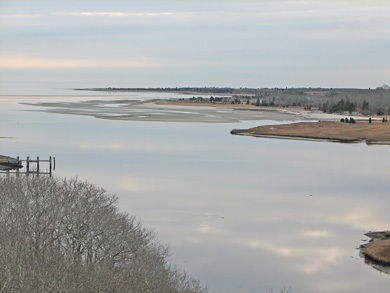 We will begin at 10am with a presentation on SEANET in Buzzard’s Bay–what do our volunteers find? What challenges do they face? What does the data show? After that, weather permitting, Jamie Bogart will take us all on a beach walk! Last time I visited, the weather was atrocious and I never got a tour of the beautiful local coastline, so I’m looking forward to clear skies this time around! I hope to see some of you there, though I issue a warning–I’m bringing my family along, and my two boys are avid beach walkers/dead bird finders themselves! 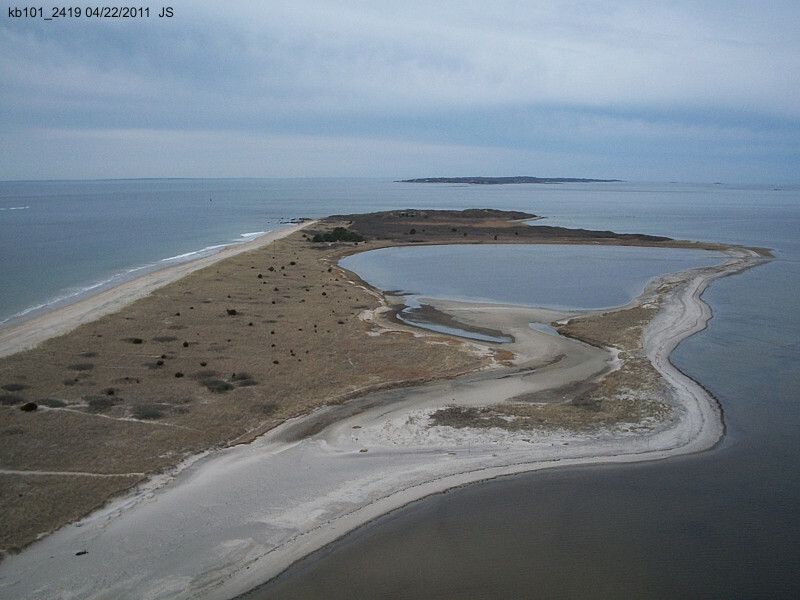 Aerial view of Napatree Point in RI, where Hugh Markey now Seanets. After the retirement of legendary Seanetter Rey Larsen from his beat in Rhode Island, we were most fortunate to see his mantle taken up by Hugh Markey. Hugh is a teacher and a freelance writer, and shared a bit of writing he did late last year for the Southern Rhode Island Newspapers. The answer to the question in Hugh’s opening paragraph here should strike all you fellow Seanetters as obvious, and it’s clear we’ve found a kindred spirit. Do read Hugh’s article in its entirety, and we expect it won’t be the last you hear from him on this blog! Thanks Hugh! 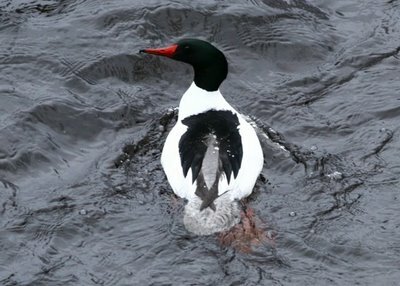 Common Merganser from above: compare the lower back/rump coloration with our Bird A. Only one answer on the quiz this time! Wow. Was it something I said? In any case, the one response we did get, from Wouter van Gestel, brings up a good opportunity to compare black and white ducks, especially when their heads are absent. Wouter suggests that Bird A is a Common Merganser, and that species (along with Red-breasted Merganser) is right at the top of my list when confronted with a headless, reddish-footed, black and white duck body. With our Bird A, we have the luxury of a wing chord measurement, which is a diminutive 17cm. Merganser wings are generally in the 21-26cm range, so this bird is considerably smaller. The other feature of note is the color pattern of the lower back and tail. Our Bird A has a black back that ends in a wedge and contrasts sharply with a pale gray rump. Mergansers (both species) have more of a gray or speckled lower back and little contrast between it and the rump. So, what do I think this bird is? I think it’s a male Bufflehead. Though as always, I invite argument. Compare with this male Bufflehead in flight: somewhat visible are the black back contrasting sharply with gray on the rump. Bird B is a scaup, which is not a species we get a lot on SEANET beaches. It can be a challenge to differentiate between Lesser and Greater Scaup, but with a good spreadwing photo, it becomes substantially easier. Both species have approximately the same amount of white on the secondary feathers, but in the Lesser Scaup, that white fades quickly to a brownish gray in the primary feathers. So, our Bird B looks like a Lesser to me. (And to Wouter, I’ll point out) In the Greater Scaup, the white persists much farther into the primaries. 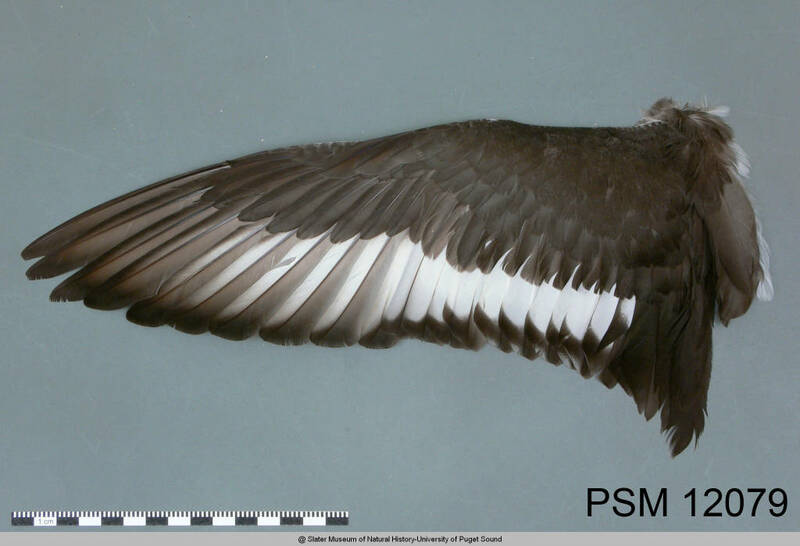 All the more argument for spreading out the wings in your specimens before taking photos! Greater Scaup wing: white extends well into the primary feathers. 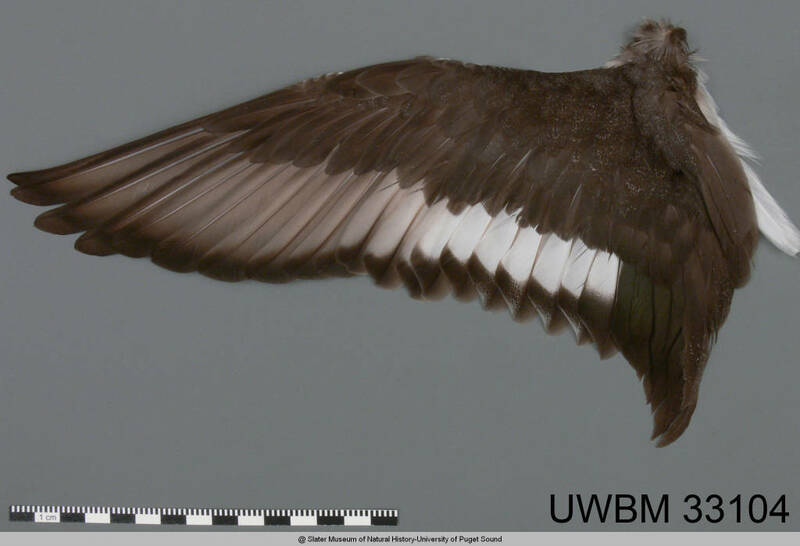 Lesser Scaup wing: white is mainly limited to secondaries and fades to grayish brown in the first primaries. Time for a dead bird quiz, everyone! 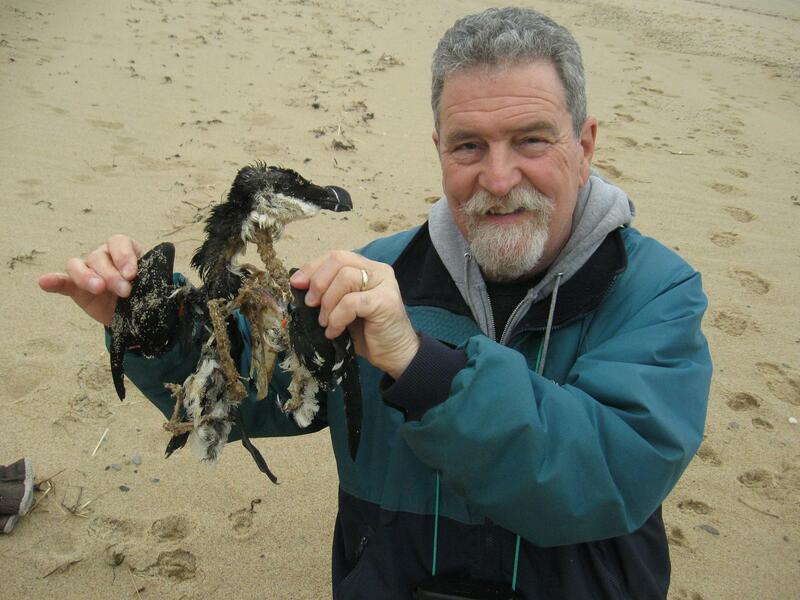 Bird A was found by John Galluzzo on his beach on the south shore of Massachusetts last month. Wing chord was a mere 17cm. Bird B was found by Becky Bartel in North Carolina last month. Wing chord on this one was 22cm. What do you think, Seanetters and friends? Try your hand at an i.d. and you’ll hear from me on it on Thursday. Good luck! 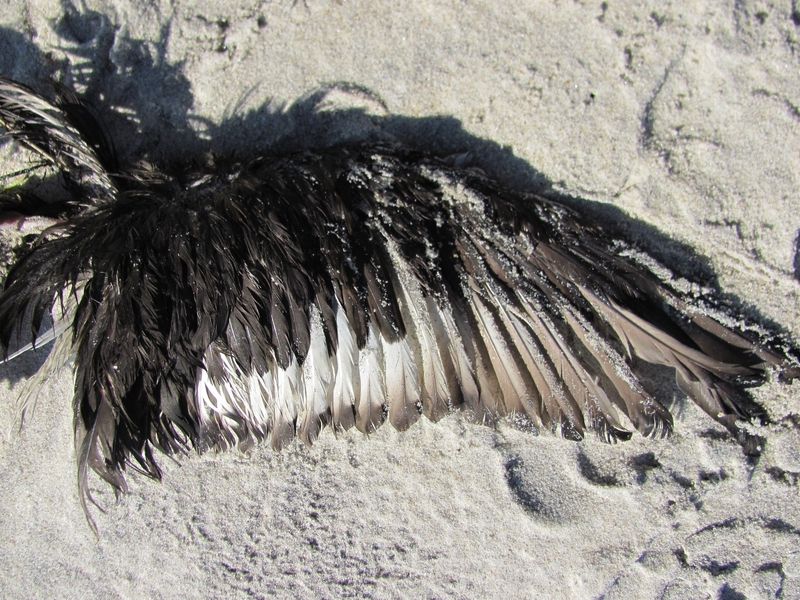 Bird A: Headless specimen found by John Galluzzo in Scituate, MA. Bird B: found by Becky Bartel in North Carolina last month.